LavaScape ground cover is a naturally formed product from the Nazko Cone Volcano. It is inert, black and beautiful. 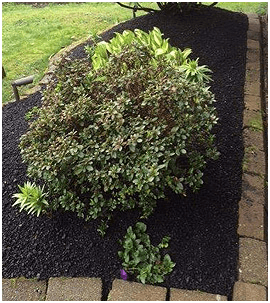 Unlike bark mulch, LavaScape does not stain or break down over time. LavaScape also holds a high concentration of moisture that helps existing plants collect water. Tired of weeding? LavaScape reduces weeds ability to take hold. Customers that weeded gardens once a week are now weeding once every two months. Tired of rain splashing dirt on the side of your house and fences? LavaScape does not splash up onto adjoining vertical walls and fences like top soil and planting soils. LavaScape is available in bulk or smaller totes. Please contact the Canlava sales team for details.